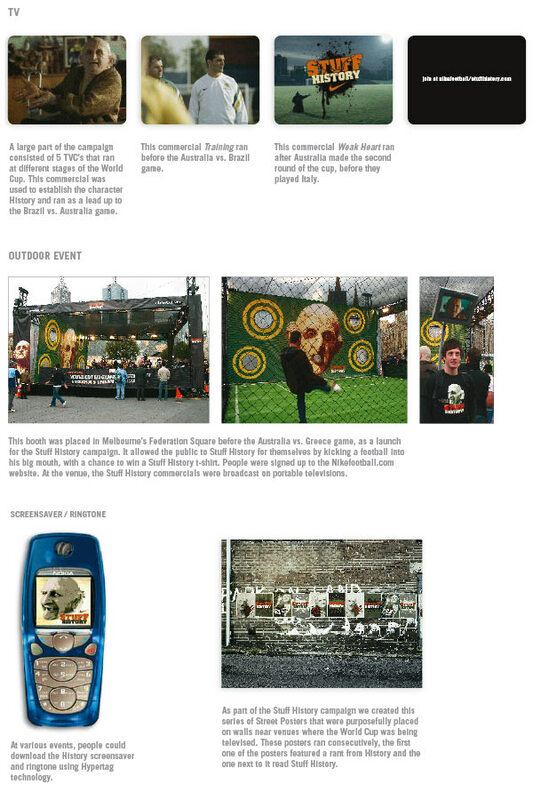 This campaign was created to generate support for the Australian Soccer Team (The Socceroo’s) in the 2006 World Cup Finals. As the team and the country had a very poor history in soccer, we came up with the idea Stuff History. We then created a character called History who was anti Australia. We wanted people to hate him so we made him as nasty as possible. In all media we gave people the opportunity to stuff him. Five TVC’s were created to run before each of the group games and the round of 16 game. This campaign worked brilliantly generating an enormous amount of media coverage, with articles online as well as in The Age, Sydney Morning Herald, Daily Telegraph and a feature on TV.